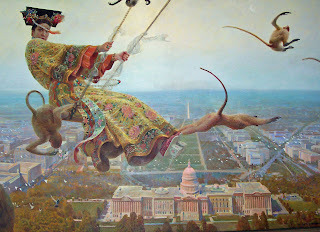 "A large signature painting, 'Above Washington, D.C.', commissioned by Chinese/Canadian artist Zhong-Yang Huang, depicts the last empress of China, Empress Dowager, on a swing over D.C., blending Eastern and Western cultures. She lived in the 'Forbidden City' and had a fascination with the West. The artist has created a painting that is historical and metaphorical." There are other works by the same artist at a gallery in Saskatchewan, Canada. I’ve also found other background on the artist. Note to self: next time in DC get a better, higher res photo. It really is quite a stunning painting.